Love cookie dough? 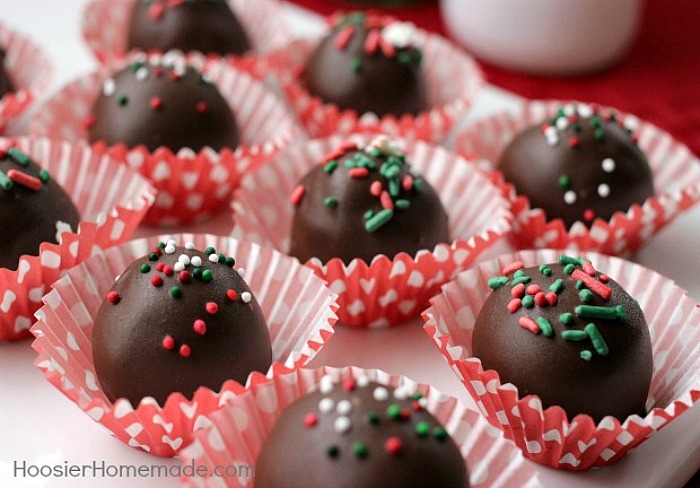 This Cookie Dough Truffles Recipe is one I have been making for years. It’s super easy, and filled with delicious chocolate chips, but don’t worry, there are no eggs, making it safe to eat! I have to admit, I need quite a bit of will power to not eat the raw chocolate chip cookie dough when I’m baking cookies. I know, it’s not good to eat raw eggs, but it just tastes so good. Well, this Cookie Dough Truffles Recipe solves all that. No eggs at all, just delicious chocolate chip cookie dough! 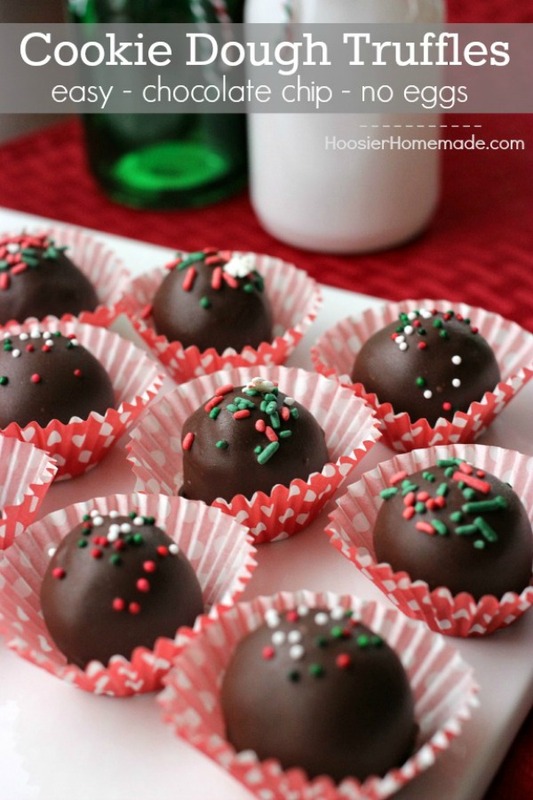 Not only are these cookie dough truffles perfect for the Christmas holiday season, I have made them many, many times for all sorts of occasions. They are actually one of the most requested treats from my boys, especially our youngest. The cookie dough balls don’t even have to be coated in chocolate, he grabs them straight from the freezer if I don’t stop him. After the dough is mixed, and the balls are formed, into the freezer they go. It’s best to leave them for at least an hour, longer is fine too. I’ve even left them for a week, although there are usually some missing if I do that. Then I remove them about 5 or 6 at a time, keeping the others in the freezer to stay cold. Then dip them in melted chocolate coating and immediately add some sprinkles. When I am coating the cookie dough truffles with regular chocolate I always use Almond Bark, it’s in the baking aisle, I have found it melts the best. But chocolate is also versatile, for a totally different look, I used red, white and blue coating for my Patriotic Cookie Dough Truffles. The ideas are endless! 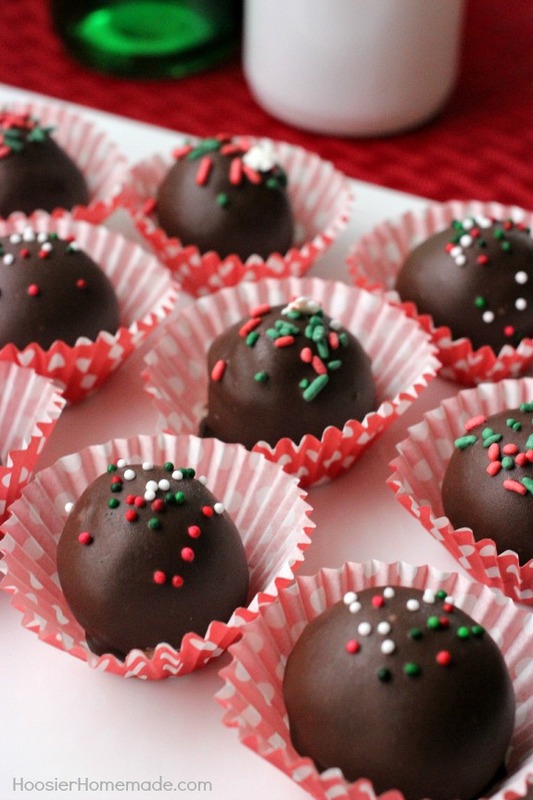 These Cookie Dough Truffles also make great gifts from the kitchen! Who doesn’t love receiving a box with chocolate chip cookie dough? Perfect for any occasion, gift giving or enjoying at home. In a large bowl, cream butter and brown sugar until fluffy, beat in vanilla. Gradually add the flour, alternating with the milk. 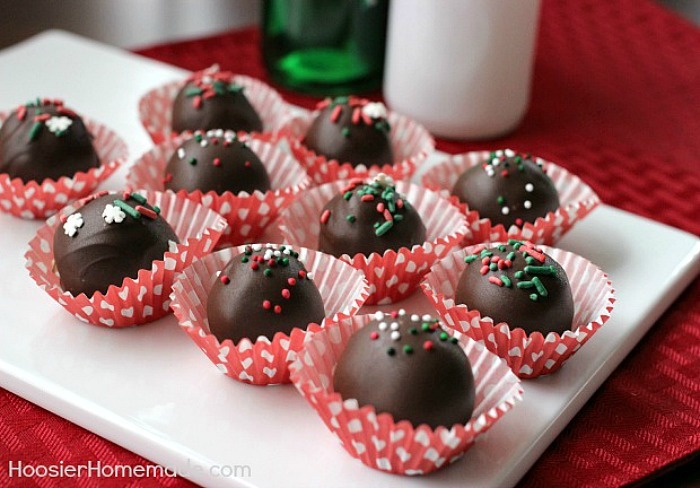 Remove 5-6 balls from freezer and dip in chocolate, place on wax paper. store them in an airtight container in the fridge. It's best to let them warm up a bit before serving. How do you store these? Must they be refrigerated? Hi Susan, store them in an airtight container in the fridge. It’s best to let them warm up a bit before serving.